Penfreak: TIHAR: NOT THE JAIL, BUT GORKHA'S DEEPAWALI - EVER HEARD OF IT? TIHAR: NOT THE JAIL, BUT GORKHA'S DEEPAWALI - EVER HEARD OF IT? Deepawali or The festival of lights is indeed a very beautiful festival. With Lights! Lights! Lights! All around, this festival is unique in its own. And the way , I (or any gorkhali ) celebrate this festival called TIHAR is something different from the mainstream diwali. DAY 1 : “KAAG TIHAR” or worshipping the Crow. Yes!! Crow ! Our diwali does not merely starts worshipping the god or the goddess but we start our deepawali by feeding the crows. Crows and ravens are worshiped by offerings of sweets and dishes placed on the roofs of houses. The cawing of crows and ravens symbolizes sadness and grief in Hinduism, so devotees offer crows and ravens food to avert grief and death in their homes. Day 2 : “KUKUR TIHAR” or worshipping the DOGS. Yes ! Our 2nd day of deepawali starts with the faithful friends The Dogs. on this day, offerings are being made to the dogs. This is just a smaller way of thanking the faithful service of the daogs towards our social and personal security. Hindu tradition holds that a dog is the guardian and messenger of Yama, the lord and judge of the death. A dog is also said to guard the gates of the afterlife. How do we perfom it : During Kukur Tihar, the mythological and real relationships between humans and dogs constitute the day’s major focus. A garland of flowers is draped around the neck of every dog; not only those with homes, but strays as well. Then a TILAK or TIKO is marked at its forehead. 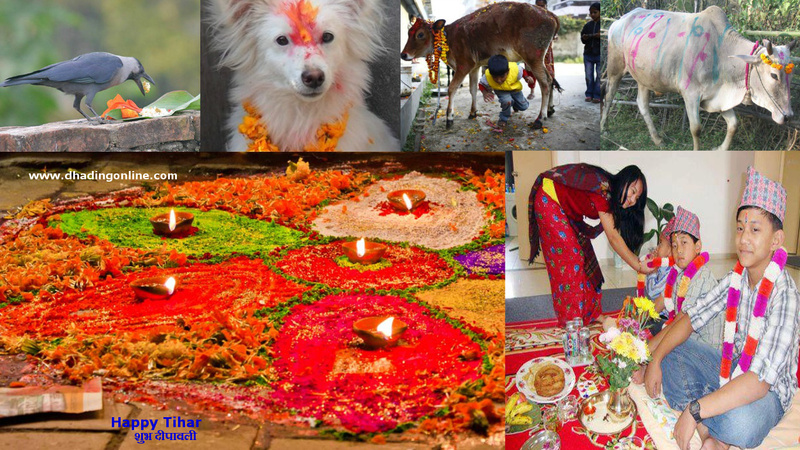 DAY 3 : GAI TIHAR (COW) AND LAXMI PUJA , The morning of the third day begins with the worshipping of the cows . The cow represents mother earth, prosperity and wealth. She gets a lot of attention all year round. But on this day she gets the best of everything! LAXMI PUJA : In the evening of the 3rd day, offerings are being placed before goddess Laxmi, the goddess of wealth. Prayers and mantras are being chanted . People decorated their houses with full lightnings and prasads are being given. After this, starts the festival of the youths : BHAILO AND DEUSI . These are traditional songs sung in groups during deepawali. Bhailo is sung by the girls and Deusi by the boys. The youths go on singing these songs from house to house. At the end of the songs, the owner of the house offers food and money to the singers who in return showers blessings upon the family for good health and prosperity. Bhailo is mainly sung on the 3rd day and Deusi on the 4th. Also, from this day onwards people starts cracking the fire crackers. SEL ROTI : The most important element of TIHAR. Our Tihar is incomplete if we don’t have this mouth watering food. It is a traditional home made ring shaped roti. I bet if you try it once, you will love it more than all those Domino’s or Kfc stuffs . Have any nepali friend , ask them about this. On Govardhan puja Goru Tihar, three different kinds of puja are performed. We perform Goru Puja, or worship Oxen. We also perform Govardhan Puja, which is done by making a hill of govardhan parbat using Cow dung. Cow dung has big importance in Hindu culture. In the old days it was used for everything from light at night to polish mud floors of traditional houses. Still now no Puja is complete without cow dung in Nepali Hindu culture. Deusi is very similar to Bhailo. However, nowadays there is such distinction. People go in group with males and females members to celebrate Bhailo and deusi both. DAY 5 : BHAI TIKA or BHAI DHUJ , The fifth and last day of Tihar is Bhai Tika. This day sisters put “Tika of five colours” Paanch Rangi Tika - Yellow, green, red, blue and white on forehead of her brothers, to ensure long life and prosperity of her brothers . In return brothers bow down on her feet and also puts a tiko on the sister’s forehead and assures her to protect her and save her from any difficulties . There is also an exchage of gifts as a symbol of love. Happily with such a wonderful five days celebration, the Deepawali or the Tihar comes to an end. Tihar is not just the attachment of religious sentiments but it represents on a wider scale, the divine attachment between humans and other animals. Sometimes, it amazes me how wonderful are all these festivals. How wonderful our country is !!. How diverse and How awesome it is!! And more awesome are these festivals which make our life more enjoyable. Wishing you all a happy deepawali and a happy Tihar.